Why did Bach make his famous journey to North Germany to visit the great organist - composer Dieterich Buxtehude, when there were other celebrated musicians closer to Arnstadt? Did he have lessons from Buxtehude, take part in performances or perhaps seek employment in Lubeck? And what changes took place in Bach&apos;s music before and after his visit? There will be live examples using the famous 1801 organ at Lothbury. 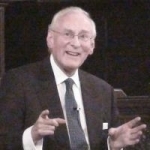 Richard is the resident recitalist at St Margaret&apos;s Lothbury where he has presented over 1000 programmes on the renowned 1801 George Pike England organ, once played by Mendelssohn. Good evening, and welcome to the finest, friendliest and warmest, nicest church in the City of London! In the Arnstadt consistory court in November 1706, Bach, who was a trouble to everybody all his life, was reprimanded and asked why he had caused what was called a Fremde Junge, a strange young woman, to be invited into the choir organ gallery box and to make music there, and I have a strange young woman up in the organ gallery to make music for me, but if you thought you were just going to be inactive here, you are wrong, because I need you to be the congregation of the new church in Arnstadt in Bach’s lifetime. You will have found a sheet of music when you came and sat on your seat. I need you to sing this chorale. Can we have a congregational practice? The worse you sing, the more authentic this will be. This is the anniversary year, 330 years since Bach was born, 310 years since he made his famous walk, and what I want to do is to pose some questions for you, because in the autumn of 1705, twenty-year old Bach decided to walk between 260 and 280 miles, Arnstadt to Lubeck, to hear, maybe to study with, the greatest organist composer in the world at that time, Dieterich Buxtehude. If Bach had never been, you would think that Buxtehude was the greatest organist and the greatest organ composer ever, and tonight I am going to explain to you, you are dead right, because that is what Bach thought. That is why he made this most astonishing walk. Have any of you ever walked 280 miles, and 280 miles back, just to listen to a concert? Without the benefit of any sort of public transport. Think, the roads were uneven, horrible. You had to find somewhere to eat, somewhere to sleep. You had to hitch lifts, you had to go on carts, you had to travel by horse, you had to walk. What an amazing feat it was! How many twenty-year olds do you know who would actually do anything like that? And after all that, when he got back, he got told off! The consistory court in Arnstadt, in February 1706, demanded to know “whither he has lately been for so long” and from whom he attained permission to go, to which the young Bach, in characteristic fashion, said he had been to Lubeck, “to comprehend one thing and another about his art”, and he had asked permission before he went there. He only asked for leave of four weeks; he stayed away for nearly four months. Now would that not make you want to do the walk?! That is the most astonishing piece at the period, at the time. Most North-German pieces begin with mid-pedal solos. They go left-right, left-right, left-right, left-right, left-right, left-right, left-right, big chord, left-right, left-right, left-right, simple! Buxtehude is unique and different. He begins with this enormous feeling of rhythm, these incredible drum-like, timpani-like rhythms, and he used the whole of the lower pedal board at the time. Here is the middle, Middle C, on the bottom note of the pedal board. The next note is the very top of the pedal board, and then he comes all the way down, and then he puts big chords in and you have this great, fantastic filigree of music playing. It was a unique way of playing that gets your attention straightaway. It is the combination of rhythm and the drama, the drama of the organ that makes its sound from everywhere. When you think the organ had prospects of 32 foot pipes, pedal pipes at the side, using all these different parts of the organ, like a stereo machine, this sound coming from everywhere. It was pretty astonishing in its day, absolutely amazing. It being around Christmas time too, you would have heard Christmas chorales and the importance of the chorale. This was what Bach might have heard. This is Buxtehude’s Prelude, and at the end, the congregation had to sing. Possibly, at St Lubeck Church, they sang unaccompanied. This is the moment you have waited for all your life. First of all, you will hear what Buxtehude does and then you must try your best. Well done! Bach got told off. Bach was always being told off – the consistory court, on February 21st 1706, said to Bach, the consistory reproved him of “having hitherto made many curious variations in the chorale and mingled many strange tones in it” and for the fact that the congregation “has become confused by it”. So, here goes, because this is the way that Bach accompanied the chorales, expected people to sing. It was the way in which they did it in many parts of Europe at the time. There is a wonderful collection in the library of Dulwich College, just over in SE21, of the accompaniments of John Reading when he was, in the 18th Century, the accompaniest to the organist at Dulwich College, how he accompanied English hymns, the same style. What happens is you sing one line, then there is a sort of happening, and then you sing another line and there is another happening, and so on through – you get the idea. The thing is that Bach, the young Bach, was rather good at the happening bits, and he was also rather good at making the most unexpected harmonies. Now you are on your own. You have got to do the best you can. This is Arnstadt, 1706 – think how old you were in 1706. You have got to have plenty of puff for this one and we will see how we get on. This is an authentic performance. Those who make it to the end get a prize. Can we have an A please? Well, you did beautifully! Now you know why people complained about him – he did this all the time! He was a terror, he really was. Bach was a real terror – such imagination though. Would it not inspire you to come back the next Christmas?! That was the idea of it anyway. It was the most important part of what the organist at that time did. This is really why Bach went I think, to find out how he could improve himself, because the organist at that time had to do two things across the church: he had do a very loud piece at the beginning and a loud piece at the end of the service; and in between, he had to do chorale preludes, and in some churches, accompanied chorales and in others, not, if they had a tradition of singing them unaccompanied. That was really what he had to do or what he had to learn to do. A lot later on in his life of course, all in good time, Bach tried to get his sons to do it too so that they had get a job. That was the meat of the job. If you can imagine, of course, in those days, you needed praeludiums because people came to church very much before the service. They had be walking around and be meeting people. There was nowhere to sit in those days. The weak went to the wall because that is where the seats were. All the rest would stand up. It was a meeting place. The church was a meeting place. But it was an enormous din because the church was always full – everybody came to church. The point of the organist was, when the service was ready to begin, he had to make a big noise so that everybody would know it was going to begin, and the same at the end. You do the same now in weddings nowadays actually. In between, he had a prelude on the chorales. The important thing to remember is that, in those days, none of you would have been able to read or write. You had to learn everything by heart - all the chorales you would know the texts by heart, and they did not sing an enormous number of them. At every service in Advent, they would have sung the same chorales, in Lent, the same chorales all the way through. There was a small corpus of these things which they knew, and the texts were in their hearts. The ideal was that you would have a good tune – why should the devil have all the best tunes? They should have a good tune for singing, they are all good tunes, and some wonderful tunes, and you did alright. They are beautiful and wonderful tunes, but the important thing is not the tune, it is the words and what the words mean. It is not the same as where you, maybe, switched the tunes around. Every chorale had one tune, so they had learnt them from cradle to the grave. What the organist had to do in the prelude was not therefore to reproduce a tune because everyone knew what the tune was, perhaps to give the pitch they were going to sing it at. What he had to do was to make a colour picture, as it were, the meaning of the text. I have just chosen one chorale tonight, “Nun komm, der Heiden Heiland”, the great advent chorale. Bach must have heard this when he made that trip because he went at Advent. At every single service, they would have sung “Nun komm, der Heiden Heiland”, “Now comes the Saviour of our race”. It is a wonderful chorale, and here is the prelude from Buxtehude. The thing you have to listen for, and to remember if you can, are the last eight bars. This is a filigree, a wonderful light-hand solo with incredible harmonies underneath. Harmonies are the imitation of the chorale. Everything, the whole thing was there and, by the end, you have got the idea of the Saviour coming down to Earth at this time. Imagine the music as a stained glass window. Imagine the whole thing, and by the end, you have got the story. So, here is Buxtehude. Keep it in your head. Now, here is Bach. This is the same key, same tune, same degree of filigree, the same left hand developed from the harmony chorale, but it is, in a sense, a more concise piece. It is a deeper piece. The cadence is amazing at the end. The most amazing thing is the last eight bars. They are similar. They are not identical, but they are similar. Bach would have heard Buxtehude in Advent 1705. The prelude was written when Bach was at Weimar, probably about 1717. He then later revised it, this time in Leipzig, as he did with all what are called the Leipzig Chorale Preludes. Towards the end of his life, towards the 1745s/1746s, he revised this, and you think to yourself, how do musicians remember things that long? I suggest that it comes again and again – you can do the same with Mozart, you can do the same with Haydn, same with Beethoven, same with Brahms. Musicians do remember things, because, remember these are huge periods in your life and that is what Bach obviously did. All the things which he must have heard at the St Lubeck, you can hear them coming in later pages of Bach’s music, the whole time, there is always the feeling of Buxtehude right though his writing. Even up to the very last pieces he wrote, in his last two years in Leipzig, you can hear the influence. And in this extraordinary prelude, which is one of the finest pieces of organ music ever written, an extraordinary thing, the base pedal, all the way through, moves in quavers, boom-boom-boom. This is the Saviour walking down from Heaven. It is a pure picture that he has painted for people who will listen to this prelude. This is exactly what a chorale prelude is meant to do. You have these incessant footsteps the whole way through. Along the top, you have the angels’ tune, augmented, in every single way, this filigree. It is the most amazing thing. The tune is always there, keeping the whole thing tightly together. The composition is almost total perfection. When you get to those final two bars of the cadence, you have this extraordinary way in which Bach can make a cadence seem so natural, and if you then had to sing “Nun komm, der Heiden Heiland”, you would sing it very, very softly, because you would have been totally consumed by this wonderful composition. You know, Bach could not have written that piece if he had not gone to hear Buxtehude. It is a unique way of writing a chorale prelude. It is wonderful, an absolute jewel of a piece. That proves, if nothing else, what he learnt in that walk. That is musical rhetoric for you really. It is exactly what all north Germans did at the time. It was full of mistakes too. Let us suppose that Bach did have lessons with Buxtehude, so let us sit in on one of those lessons. Buxtehude says to Bach, “Well, play me one of your pieces.” Remember, in those days, that people always played their own music. They did not really play other people’s music. All the music which Bach wrote, he wrote for himself to play. Same with Buxtehude: all the music he wrote for himself to play. If you were sitting there as a pupil, and the way you learnt was by sitting at your master’s footsteps really, if you were sitting there and thought it was a good piece, you would then go and write it down. You would do, as it were, musical dictation. Most of Bach comes down to us in copies made by his pupils – very little in his own hand. They were able to do this. So, Buxtehude says, okay, Bach, play one of your pieces, so he played that piece. Let us see where it goes wrong. Well, it begins with something like that, da-da-da-da-da. Yeah, well, that is very good - people will probably listen to that, that is alright. Then you have got the pedal notes. Well, that sort of sets the key. It is in their head. Then comes a flashy bit. Well, if you are twenty, you always do flashy bits, and they all had to be done, very essential. And then you have a solo. Mr Bach! That solo is rubbish! Anyone can do that. So, you really cannot get away with that. And then you have got another flourish. You have just had a flourish. You cannot have two flourishes in a four pedal solo. What is that? That is not really very good. Well, I thought it sounded good, Sir, I thought it was really rather good, pedal octaves going, big chords over the top, really good, and then I turned it upside down and did the other hand, so I thought that was rather clever. Well, it is pretty feeble, when it comes down to it, pretty feeble, was that not good. And then you have the pedal solo – everybody does that. I have heard that everywhere. Everybody does that. Could not you do something more special? original? Bach must be getting a bit fed up by that time I reckon. It is quite a short piece. It is not bad for a beginner, but it is not really what it is all about, and if you are going to study with me, I think I will tell you how you should actually write really good baroque praeludium, the first thing you must do is to get the people’s attention. You must do something that really gets their attention. At the same time, at the end of the first bit, they must know what key they are in because when you start a musical journey, you must know where you start from because, in the end, you have got to get back to there, otherwise, nobody will know the piece is finished, basically. The great thing about a piece of music, it has to start somewhere, it has to go somewhere, and it has got to come back, and you have to fit that into people’s ears. You have got to establish a very strong sense of key. So, the beginning of the movement must set a very fine key sense, and this flashier piece must have something to bind it together. If it is only flashy, it is only flashy, so the easiest thing for organ to do is to have an ostinato base. Anybody improvising always talks about this, an ostinato base gets you out of any trouble whatsoever. That will bind it all together. So, this is, Buxtehude, this is how I would do it. Got the idea? It is coming on very well. Yeah, but, Mr Buxtehude, by then, half the congregation will have fallen asleep, will they not? It is just so intellectual! I still have peasants and bee-keepers and things like that. That is alright. We will get their attention back because now what we do is we will do something really exciting, really thrilling, really different, and what is more, be so virtuoso that most other organists could not play this. The great thing was that Bach always had a virtuoso piece in his programmes. This is one of the big differences between Bach and Buxtehude. Buxtehude had this enormous dramatic sense. He put pieces together in short sections, joined them all together to make a wonderful dramatic piece you’re about here. Bach played a continuous piece. You think of any piece of Buxtehude, it is a little series of little short movements, put together, something that has taken perhaps one minute, one and a half minutes long, and you put them together to make a six minute piece. You know the big E flat prelude fugue of Bach takes 14 and a half minutes to play – that is the difference. All baroque music was short pieces, until Bach. Bach had this wonderful way of making an enormous span of music hold together. He had a great control not only of melody and rhythm but also of harmony and structure to make the pieces really stand. The big preludes and fugues of Bach are 12, 13, 14, 15 minutes in length – an incredible achievement, not equalled until you get to Beethoven. That was the greatness of Bach, his overarching sense of style. It was all based on the music he learnt from Buxtehude. If we now play the whole of this wonderful prelude in G minor. This is one of the gems of early baroque music, one of the finest pieces of organ music to play, and hopefully to listen to. It is inspiring to play this music. It is almost like being on a trampoline. It has enormous pedal solos and enormous rhythm. It has got enormous contrasts and enormous drama, almost like going to “King Lear” and “Othello” all in one. The whole piece is really just stupendous. This is one the great pieces of organ music of all time. This makes it worth walking 280 miles. Imagine you had never heard the music of Haydn, Mozart, Beethoven, you had only ever heard music of your own time, they did not play organ music, music entirely of your own time, and you walked that way freezing cold, in December 1706, in the dark, gloomy Marienkirche, and you heard this amazing piece from Buxtehude. I hope the music has proved to you it was worth Bach making that walk. What he learnt, you are hearing from his music. Thank you for making the journey with me.